At the ESX Console, log in and hit Alt-F1 then type unsupported and hit Enter. You won’t see the word “unsupported” appear as you type it but upon hitting Enter, you’ll be prompted for the root password. Type it in and hit Enter. Search for “name” using Esc, /name, Enter and keep hitting n (next) until you find the incorrectly named vSwitch. Change the word by hitting Esc, cw followed by the correct name, followed by Esc. If you’re happy the name has been changed correctly in esx.conf, hit Esc, :wq! and hit Enter to write the changes back to disk and quit vi. Back at the Linux prompt, type clear to clear the screen, and type exit and hit Enter to log out of the console. Alt-F2 will close the “Unsupported Console” returning you back to the black and yellow ESX Console. Esc to log out, then finally F11 to restart the host. Note I have tested this on ESXi 6.7u1 – you must restart after the change to esx.conf – other changes via UI do not work until ESXi is reloaded. 1. Enable SSH console from the management settings > troubleshooting options on the ESXi console. 2. Bring up the CLI console with alt + f1. 3. Enter the following commands to bind the VMKernel port(s) to the software iSCSI adapter (ESXi 6.7). I was recently asked to assist our training environment with the deployment of mid market Dell data center utilizing OS 10 and Virtual Link Trunking. VLT is Dell’s implementation of multi-chassis etherchannel, similar to Cisco’s Virtual Port Channel. OS10 is an open networking platform, runs on Debian Linux and boots of the ONIE (Open Network Install Environment) boot loader. Dell vLT allows multiple switches to appear as one logical unit. VLT has layer 3 routing features and as such out of box can replace FHRR protocols such as VRRP. In this design there is a pair of S4112F-ON switches connected at 100gb/s. The left side is PVST+ root bridge for all VLANs and it is also the primary vLT peer. One thing to note in regard to the Dell vLT peer-routing feature. Both L3 SVI IP addresses will perform IP routing for a subnet, if the primary switch in a VLT peer goes down then the secondary will transparently respond to IP routing request. You can not ping the primary gateway IP when this fail over scenario is in affect. Note that vLT port-channels require a mirror of configuration on both switch members. This is regardless of access or trunk mode port-channels. There is an example below. 4. alt + f2 will switch you back to the vMware DCUI console. show run policy map to verify the policy map. What’s the command so that you can see hashed passwords on the Cisco ASA CLI? Very handy for when you need to copy passwords from one device to the other. Turns out in your DNS server the reverse lookup has to match the hostname (A Records) of the ISE node(s). So my issue was that i had two zones and the ISE names and the elasticsearch component of ISE was picking up the non primary zone during a reverse DNS lookup. I removed those records and the error disappears and the correct data shows in the work center view. We recently encountered an issue wherein a particular training building required network access. It was actually a shed used to teach carpentry and bricklaying etc. As this building never had fiber optic or conduit connected to it, a cost effective solution was sought after. I decided to use Ubiquiti Networks AirMAX Prism 2 product. I was able to create a “virtual wire” from the existing Cisco Catalyst based campus network to the shed using the AirMAX Prism 2 product. The really cool thing about UBNT gear is that is supports enterprise standards and in this case that is dot1q trunking and layer 2 protocols like CDP. Our link is only around 25 meters in distance so speed was not really going to be a problem as the Prism 2 product is 802.11AC capable at 20/40/80 Mhz channel widths. I was more interested in stability of the link over speed. Granted we were able to achieve 300 mbit – which is a good result for the staff and students working in this area. 2 x UBNT Airmax Prism 2 AC radios – both come with GPS for plotting distance. Note these come with POE injectors. 2 x Ubiquiti 5GHz AC RocketDish, 31dBi (compatible with Prism 2 radios). 1 x Cisco 3702i AC wireless AP. As shed never had any data cabling we decided to install our enterprise Cisco AP to provide network access to the building. This is why I didn’t bother with a 48 port Catalyst switch – a cheap POE switch from FS.com will do the trick. The Prism AC configuration is AP for main and station for shed side – this allows pass through of VLAN tags for dot1q trunking. Cisco AP on far end needs a specific native VLAN as it is running in flexconnect mode. 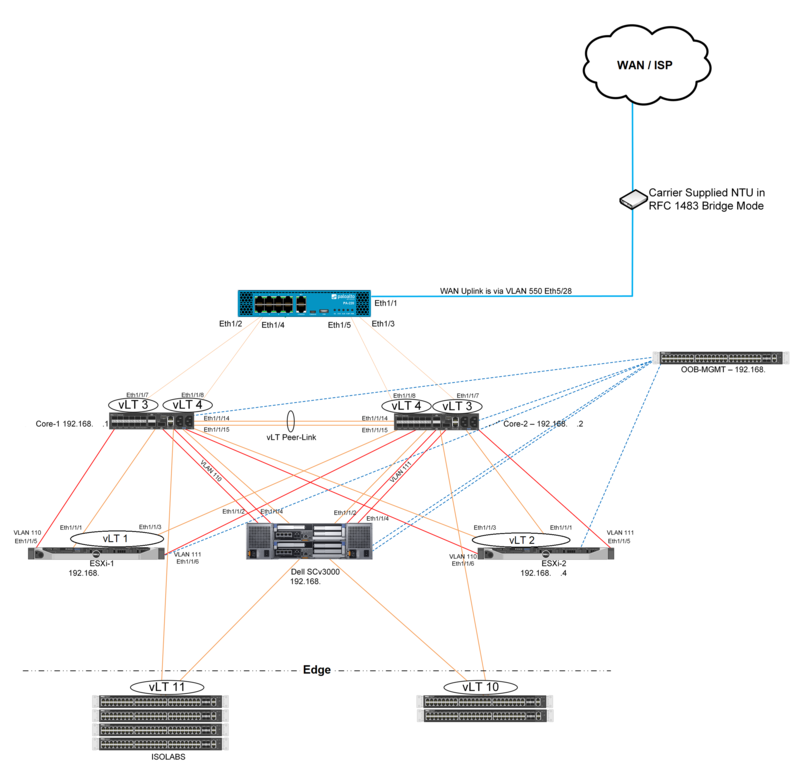 FS.com managed switch supports dot1q and powers Cisco APs out of the box with out injector, you can also tag your inband mgmt vlan for the switch managed IP address.